It's no news that the world is one huge, interconnected marketplace, fueled by international trade, global manufacture and global demand, and an almost unimaginably vast transport infrastructure. This year the BBC undertook a unique project to explore global trade...the took one of the ubiquitous shipping containers that are the basic unit of international commerce, marked it up with the BBC logo, slapped a GPS unit on its roof, and are tracking it as it journeys around the world. The Box was last spotted being unloaded off a cargo ship in Shanghai. 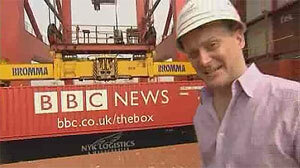 The photo above is from a BBC TV report on the box's arrival. Fans of The Box can follow its progress on the BBC website. It's expected to hit the high seas again any day now.